Fairest by Marissa Meyer (bought) - WARNING! I cannot review this book without spoiling the others in the series. Read no further if you're planning on reading this series and don't want it spoilt for you. 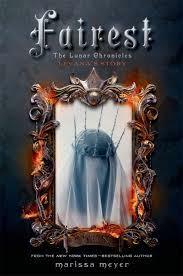 Fans of the Lunar Chronicles know Queen Levana as a ruler who uses her glamour to gain power. But long before she crossed paths with Cinder, Scarlet, and Cress, Levana lived a very different story—a story that has never been told... until now. From Goodreads. I have been such a huge fan of The Lunar Chronicles by Marissa Meyer, I was so excited while reading the first three, knowing I had Fairest, a prequel to the series from Queen Levana's point of view, to read! I was so looking forward to see why Levana is who she is, and what her motivations are. Fairest wasn't the story I expected, but it was wonderful! I was completely surprised by Levana's story. We get her backstory, right from when she was 15 until just over a decade later. I was expecting to see a cruel young girl who enjoys others' pain, but what I found was a girl who is so unbelievably insecure. Something unimaginable happened in her past that left her terribly scarred. Levana is mocked and ridiculed by her malicious older sister Channery, everyone at the palace looks down on her and laughs at her, and her parents never seemed to care. She has a crush on one of the guards, Evret, and when he shows some kindness, it's the first time anyone has been nice to her for so long. Her crush becomes a desperate infatuation, and with her innocence and naivety, she reads far more into his words than there is to read, and makes herself believe he is in love with her, too - despite the fact he is married to a woman he quite obviously adores with all of his being. Their story is such a tragic one, and I can't help but feel so deeply sorry for Levana. She just wants to be loved, and she makes herself believe it so fully, she won't accept any denial on his part. She does some terrible, disgusting things, but they are born of desperation. She is so alone, and so unbelievably lonely. She just wants to be happy, and believes Evret is the only person who can bring her happiness. Queen Channery dies while her daughter, Selene, is just a baby, and so Levana becomes Queen Regent. Under the reign of her parents and Channary, Lunar hasn't faired as well as it could, in the hands of those who cared more about their own interests than that of their home and people. Levana, however, has always taken a keen interest in politics and how Lunar is run, and discovers she's actually very good at making decisionsand coming up with ideas for the betterment of her planet. Lunar thrives, and so does she. But it's here that we start to see the Queen she will become. The people of Lunar would be more productive if they had compulsory breaks, as she has seen works well on Earth. This works well, but she is advised that revolt is likely if the people of Lunar have too much time to socialise with each other, and so she decides there should be a curfew after the work day, which will be enforced by more guards. She starts small, but the dictatorial and manipulative rule that we know her for has it's roots here, taking away this freedom from her people. She doesn't even blink at the idea, but this is probably links to how she feels about how she's treated Evret, and she does genuinely believe that she's doing what's right for Lunar, and has her people's best interests at heart. We get more of a history on leutomosis, the disease that ravages Earth in the first three books of the series. Dr. Erland touched on how he believes that Leutomosis is a biological weapon from Lunar, but in Fairest, we're told exactly how this came about. I expected to read about a cold-hearted Queen, who revels in the thought of the pain and death she is the cause of, taking sadistic joy from it all. But that's not the Levana we see. She's a politican and a strategist. What befalls earth is terrible, but Levana isn't enjoying it. She might enjoy how her plans are working, but it's a means to an end, the end being an alliance with Earth - that will be made by offering the antidote - so Lunar can have access to resources the planet is running out of. They don't have huge parts, but we get backstory on Cinder as Selene and Cress in Fairest, and are introduced to Winter. We get her backstory as well as Levana's, as they are so intertwined, Winter being Evret's daughter. Although Fairest is a prequel, it works to read it after Cress but before Winter, as it was written, because of what we already know of Cinder and Cress. Some parts might not make as much sense, or the import will be lost, if Fairest was read before any of the other books in the series. I've been told you don't need to read Fairest before Winter, but having the insight on Levana when reading Winter can help you understand the woman and her motivations as you read Winter. Fairest was a much more emotional read than I was expected. Levana is cruel, manipulative, and vicious, but she's also a woman who had a terrible childhood, who has only wants to be loved and liked, and do the best for her planet. She wants to be happy, but her unhappiness can't be cured with power, but she doesn't seem to understand this. So she's always striving for more, the next thing, and the then the next thing, and so on, desperate. Levana is a woman to be feared, but she's also a woman to be pitied. Fairest was a wonderful novella, and I'm really keen to see how my view of Levana might change as I read Winter. This series is just incredible!